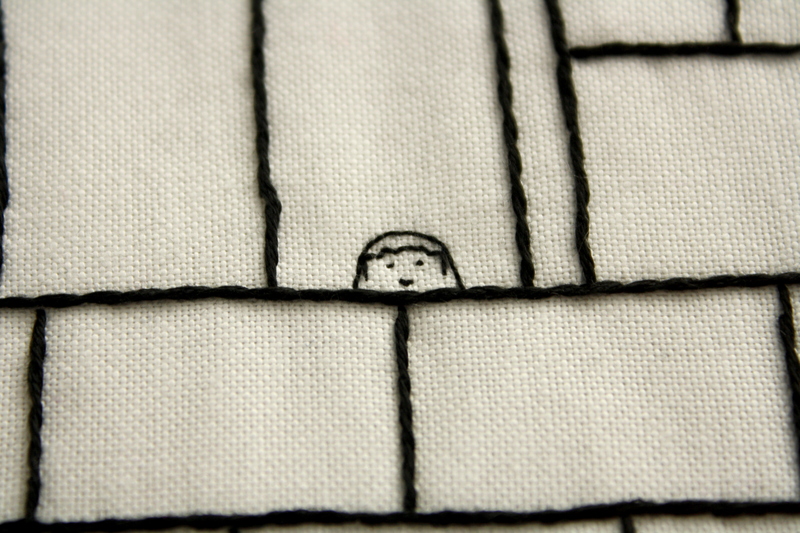 After hurrying through my final embroidereading piece, I needed a little time off from needlework. But only a few days later, on September 3rd, Stitching in Public day rolled around, and of course I wanted to participate. 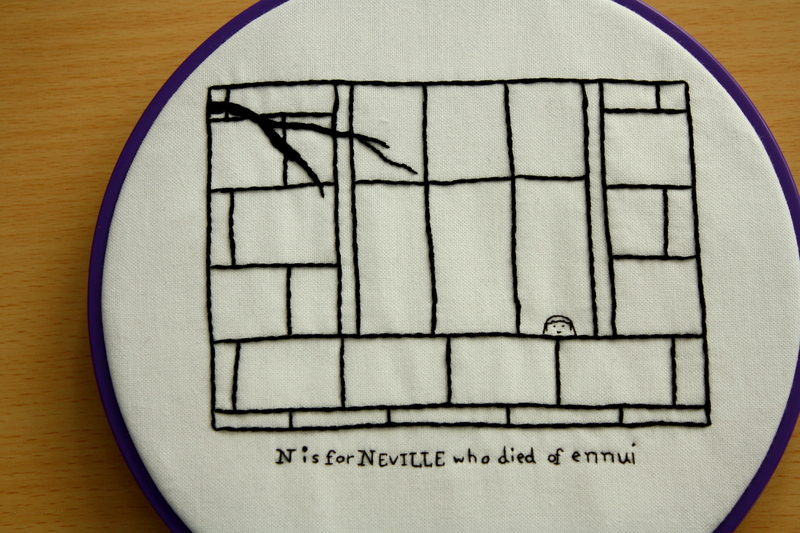 I’ve been wanting to embroider this panel from Edward Gorey‘s Gashlycrumb Tinies for ages, and this seemed like the perfect opportunity to do so. As I started planning this piece, though, I thought it might not work. The original drawing is so heavily shaded, and I wanted to keep this fairly simple. Even after I traced over the original to create my own template, I thought it was too simple and that it wouldn’t look anything like the original when I was finished. But I went ahead with it anyway. I hooped up the fabric and headed out to Starbucks. I took one of the big armchairs right next to the register so that everyone would have to go past me and see what I was doing (plus, they’re more comfortable to stitch in). No one even gave me a glance, though. Maybe because, in the early stages, this piece just looked like a bunch of intersecting lines? In the end, I’m insanely happy with this piece. It only took me 3 hours to make, shorter than most of my things, and I never reached the stage where I just want to be done so I don’t have to look at the piece any more. Plus, how great does this little guy look?! Why wouldn’t you knit a cozy for a mason jar? !